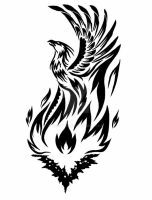 In my last poll I asked folks here on DA what tattoo designs they'd like to see from me and my dear *firewalker71 requested a phoenix. As I wanted to try my hand at one anyway I was very happy to go and do something for her. So here it is, the first of my phoenix designs and I'm dedicating this as a belated birthday pressie too. EDIT: OMG over 4000 views on this? You guys are awesome. Thank you all so much! Initial sketch done in pencil. Finished in PS CS3 with Wacom Volito2 tablet. Total time: 2 1/2 hours. Well I'll be darned! That does look strangely familiar doesn't it?! This tattoo design has either been copied from Obsession or she has copied it from you. This is basically the base design I used for my tattoo. Check out my profile for the pic of it. I'm sorry to be accusing, it's just a little unnerving having a design that you thought was fairly unique tattooed and then seeing it pop up all over the place. There's another person whose name escapes me now, who has the same sort of design that he says his wife drew. I can believe that and I wasn't meaning to sound overly defensive it's just a little unsettling to find out what you thought was your own has been produced/distributed or whatever by someone else. Thank you kindly muh dear! Now I've done this un I'm gonna start on one for you next. Before I even read your comments, the first thing out of my mouth was: "Oh, I like that. . ." lol. And I do! This is awesome Kate!